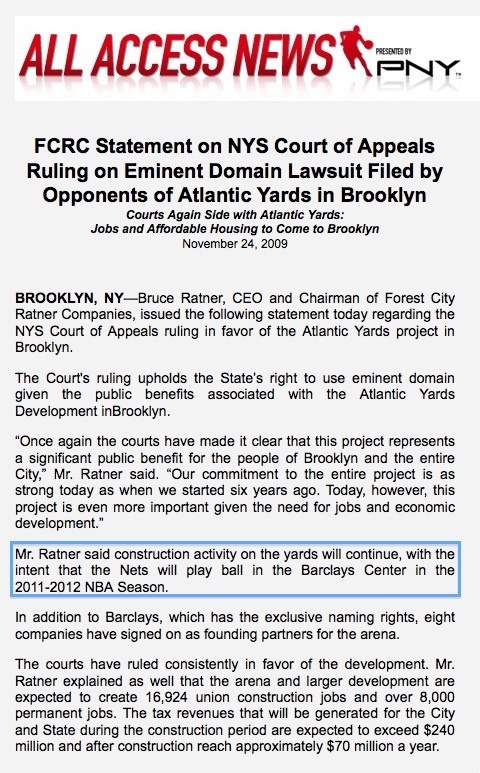 Remember how, in the wake of the Atlantic Yards eminent domain decision 11/24/09, Forest City Ratner issued a statement asserting "the intent that the Nets will play ball in the Barclays Center in the 2011-2012 NBA Season"? That implied the team would move mid-season. That was a rather optimistic "intent," especially since the New York Times a day later reported that the plan was to move in June 2012, at the end of the season. No wonder the original press release is no longer available. However, at left is a screenshot for posterity. It seems that "intent" is another weasel word for the Atlantic Yards lexicon. Thus, it's much like "anticipate," which I suggested, does not, to Forest City Ratner, mean foresee but rather "the placeholder date we don't believe but think we can get away with." Note that the press release claims that "Jobs and Affordable Housing to Come to Brooklyn." Well, there's no housing yet and the number of jobs far below expectations. 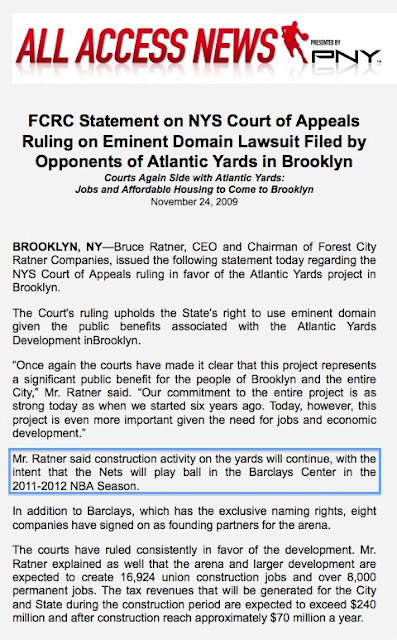 Mr. Ratner explained as well that the arena and larger development are expected to create 16,924 union construcion jobs and over 8,000 permanent jobs. These days Forest City Ratner promises "upwards of 17,000 union construction jobs and up to 8,000 permanent jobs." The only way the number of permanent jobs would hit 8,000 is if the developer built three (more likely four) office towers around the arena. However, three of the towers are planned to be housing, and there's no market for the remaining office tower. The number of construction jobs would reach that total--in job-years, as in 1700 jobs a year over a decade--only if the project is built in full (unlikely) and if no modular towers are built (who knows).